Secret Pinnacles, Sharks and consistently clear blue water are a few of the reasons to visit North Point. Huge towering boulders stretch for hundreds of metres away from the island and into the depths. As the most northern stop in the Similan islands, this dive site makes for a delightful farewell before your Similan liveaboard cruises up to Koh Bon. From the moment you jump in, there is lots to see. With typically very clear water, the huge schools of fusilier are visible from the surface. Enormous boulders between 12m-30m form impressive towers, deep channels and caverns. Ornate ghost pipefish, Pygmy pipe horse, blue dragon nudibranch and purple fire gobies. Napoleon Wrasse, Tuna, Trevally and stingrays are all here. Head out deeper to discover a secret pinnacle and look for leopard sharks, white tips and even Manta Rays! North Point is a boulder dive site with swim throughs, overhangs and huge channels. The boulders start close to the island and extend north in several sections for hundreds of metres. The sea fans get progressively larger the deeper and further from the island you get. You will see none bigger than the Gorgonian Sea Fans on the secret pinnacle. The coral in the shallows is not in such a healthy condition, but it is a great place to find hawksbill turtles and banded sea snakes. Open Water divers will be restricted to everything south of the buoy line, as this takes you all the way to 17m. However, the biggest channels are shallower than 18m and it will give you more time to search for turtles. Similan island nine is the best chance of a close encounter with a turtle, as they can be found anywhere between Three trees and Christmas point. Hawksbill turtles are the most common but you can occasionally encounter the larger Green turtle. The Secret pinnacle almost directly north of the main pinnacle is quite stunning. 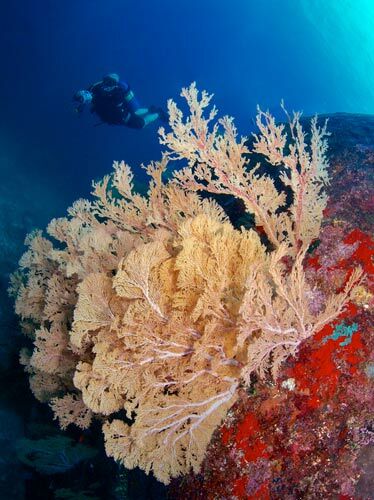 See dozens of pristine Gorgonian sea fans larger than any others in the Similan islands. White tip and Leopard sharks are regularly spotted here. February to March you can encounter Manta rays. To get there can be difficult and in a strong current it is not always possible. Consider the deep specialty course as there is a lot to see below 30m. A 28% blend of Nitrox will help even more. The largest rocks form a huge channel right at the centre of North point. They tower from their base at 18m all the way up to 5m. They are usually clearly visible from the boat so you can’t miss them. Search inside the whip corals to look for Ornate Ghost Pipefish and Clown fish living in the anemones. Spend your safety stop just above the rock looking for small blennies and maybe see a Napoleon wrasse pass underneath. A collection of large granite boulders extending out from the shallows of Similan Island nine. The boulders keep on going in a Northern direction and the furthest point of the secret pinnacle drops down to below 50m. With nothing north of this dive site, you can sometimes be left a little exposed to wind and waves. Also, if currents are strong and you cannot reach the furthest points, it can be better to do a drift dive instead. Close to the bottom, inside the largest channel, is a great place for wide angle photography. Face towards the light for a high contrast image of two monumental walls either side of you. Save time for a close up with a turtle in the shallows. 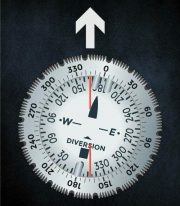 With only one dive here, you will need to navigate the dive site efficiently if you wish to see all the best parts. As North point is a long dive site, the best way to see it all is in a zig zag formation. Start your dive by going to your deepest point and then work your way back from there. Keep following the rocks going east, west, east and so on as you gradually shallow up. Stay near the rocks and you cannot get lost. If the current is not strong then this dive site can be a great place to do a navigation dive as part of your Advanced Open Water course. North point is suitable for divers of all levels. Less experienced divers can get dropped off in the shallows but most divers will jump at the mooring line. There is one mooring line on the dive site that goes to a depth of 17m. Hold the line on the way down. If there is any current then holding the line will be less strenuous and help reduce your air consumption. There is one swim through under the line and another bigger one to the West. Head through the larger swim through, past a few big sea fans, and turn right. Venture out north to the deepest part of the dive site. You will pass some large coral heads covered in glassfish and sometimes you can find pygmy pipe horses sitting on the rocks. When you get to the edge of the site, stay at 30m and hover over the sand down at 35m and deeper. This is where you can look for sharks and stingrays out in the sand. Heading back to the shallows in the south, the best way to cover the dive site is zig zagging east and west. There are several other swim throughs, overhangs and channels. Look above the boulders to see hunting fish like Tuna and Trevally. You can see large schools of parrotfish and the occasional Napoleon Wrasse. On the walls are several kinds of nudibranchs including the Similan Islands iconic blue dragons. The Whip coral in the channels and overhangs can be a great place to find Ornate ghost pipefish. Sometimes currents here can be quite strong. If you want to see the dive site you will need to stay close to the rocks and the sea bed to get more protection. If you hug the rocks you can cover the dive site with not too much difficulty. If you are not comfortable in current then it is better to stay on the shallow reef and do a drift dive (see Breakfast Bend). Finish your dive in the shallows where you can look for turtles and sea snakes. The coral reef is not so healthy here, but there is still a lot of marine life. You can then either do your safety stop in the shallows or swim back out to the largest channel and hover over the top of the rocks. If your Similan liveaboard is moored up, you can swim back to the line and do a safety stop there instead. Use this route when the current is not too strong. Jump in at the mooring line. Follow it down to 17m and then swim North to your deepest point at the start of the dive. Zig-zag your way back across the dive site, going through as many channels and swim throughs as you can find. North Point is one of the easiest dive sites as the rocks run almost exactly North. To get to the secret pinnacle, go to the deepest boulders in the North West and then head directly North. Finish the dive either at the buoy line or in the shallows looking for turtles. First things first, shark sightings are far from guaranteed at any dive site around the Similan islands. North point is one of the best dive sites to spot sharks, but it is definitely not a certainty. This hasn’t always been the case. If you read the most commonly used Similan guide book (published by pocket divesite) they still refer to Koh Tachai reef as ‘Leopard shark reef’. Leopard sharks started disappearing from Koh Tachai long before its closure in 2016. For many year already, the numbers of sharks have been decreasing season by season. Hopefully that is in the process of changing. The Similan and Surin islands are national parks and are therefore protected from fishing. However, the protected area only extends 3km around the islands. For the small reef fish this is enough, but for animals like sharks that travel farther, this still leaves them in danger. The rise of shark fin soup has lead to a massive demand for sharks. At its peak an estimated 100,000,000 sharks were killed every year. This has dramatically affected shark numbers. Removing the apex predator from any ecosystem will undoubtedly have a very negative impact. However, it is not all bad news. One major change in Thailand has been the implementation of much stricter fishing rules and regulations. It began in January 2015 when the EU threatened to ban importing fish from Thailand unless they quickly enforced new regulations and punished or revoked licenses from operators unable to meet these standards. The military government were quick to react and over 8000 fishing vessels lost their licenses. Other boats changed their nets (to prevent them from catching juvenile fish) and had to stop certain practices such as dredging. This seems to have had a positive impact on fish numbers already. Other organisations have helped to raise awareness of declining shark numbers and internationally more is being done to protect them. In the 2015-16 season we saw many more sharks than in the previous few years. Around the Similan islands it is possible to see white tip and black tip reef sharks, leopard sharks, nurse sharks, guitar sharks and of course whale sharks. At North point it is not uncommon to see white tips or sometimes Leopard sharks out in the sand. Numbers of sharks in the Similan islands may not be that high, but they are increasing. North point, Christmas point, Elephant head rock, Koh Bon and Koh Tachai are probably the best dive spots to look for sharks in the Similan islands. If you see a shark there are several things you can do to help. Firstly, treat them with respect and give them some distance. One of the reasons we see less sharks may be because of inappropriate behaviour from divers pushing them further away from the dive sites. Stay at least a few metres away from them, never chase after them and try to keep flash photography to a minimum. You can also log your dives on eShark. Here you can record sightings of sharks, turtles, jellyfish, rays and even garbage. As it states on their website, ‘a healthier ocean starts with data’. Finally, if you encounter a shark, enjoy it. They are extraordinary creatures to encounter with a prehistoric ancestry that predates most dinosaurs. Every encounter with a shark is a true privilege.